The best design software can be used for creating both websites and icons. If you search around you’ll find plenty of icon tuts for Illustrator, Photoshop and for Sketch too. But written guides aren’t always enough when it comes to visual design. I often prefer video tutorials because they’re more straightforward offering a step-by-step approach. And in this post I’ve organized 15 of the best free icon design video tutorials covering a variety of software and different icon techniques. No matter what your skill level I guarantee there are a few videos here that can teach you something new. Perhaps the best design software for icon design is Adobe Illustrator. It’s the de-facto vector design software for everything from digital illustrations to complex iOS icons. 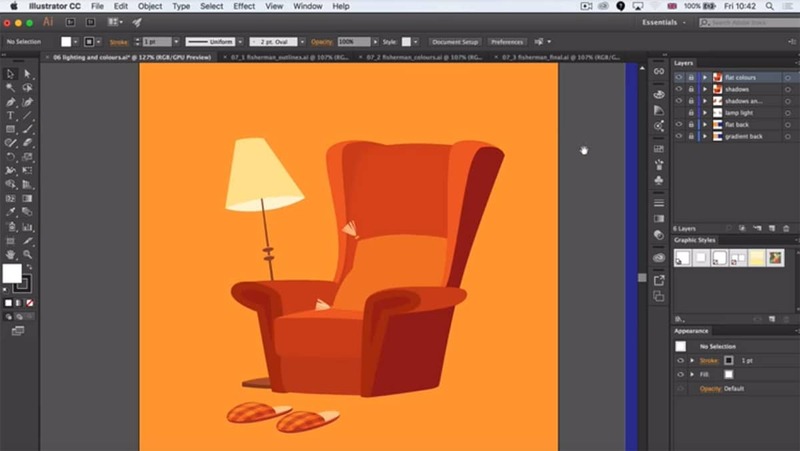 In this 43-minute video you’ll learn how to draw anything using Adobe Illustrator. It’s not an easy process so you won’t pick it up just by watching the video. You’ll need to spend hours practicing and repeating the techniques on your own to get them ingrained into your brain. From there it’ll be like muscle memory and you’ll be able to create your own illustrations from scratch. It’s best to start with the demo in this video but be willing to try other illustration exercises too. One of the best features in Photoshop is the expressive use of layers and custom effects. This lets you create anything from glossy gradients to 3D scalable badges like in this tutorial. Note that Photoshop does have a 3D feature, one of many in the newest CC version. But for this tutorial you’ll learn how to create the illusion of depth with vector shapes that make buttons appear to be 3D. It’s a technique that anyone can use and with enough practice it can become a staple in your icon design work. If you’re brand new to icon design I recommend starting with this video designed by Icons8. It’s a newer guide to icon design covering all the tools you need to make pixel-perfect visual icons. It’ll walk you through the differences between vector & bitmap elements, how these work in a program like Sketch, and when you should use pixels vs. when to use vectors. Note this is not a step-by-step guide to a single icon like these other tutorials. Instead it’s an overview of icon design teaching you the fundamentals using examples along the way. Getting back to app icon tutorials we have this material icon video that’s just shy of 30 minutes. It’ll help anyone learn how to create material design icons from scratch with a handy template and guiding steps along the way. The final product is a simple long shadow icon but it shows how you should create your icons and the template you should follow. It’s an excellent choice for Android app developers or anyone who likes Google’s material design for the web. The golden ratio is a popular concept in general design that branches into icons & visual arts. This follows a very specific ratio found in nature and some people mimic this ratio in design work. If you want to approach the golden ratio for icons then this video is worth a watch. It’ll introduce you to how the golden ratio works and then use a sample icon tutorial to demonstrate the process. Everything you’ll learn here is based on common grids so it’s a good idea to pick up some grid patterns and apply these to your icons too. The Inkscape software is a 100% free open source alternative to paid design programs like Photoshop. It’s not the most widely used software but it does work well for anyone on a budget. And if you’re hoping to learn icon design with Inkscape should start with this video created by designer Nick Saporito. It’s only 19 minutes long but it offers a solid introduction to icon design and the Inkscape interface. You don’t need any real prior experience in the software but it’s certainly helpful if you’re familiar with Inkscape already. Anyone can pick this up and get started so it’s a solid beginner’s guide too. Here’s another Inkscape tutorial that gets a little more in-depth. Isometric icons take a very strange perspective and they’re not popular on many websites. But they provide excellent training for icon design and this shop icon video is great for learning the Inkscape interface, isometric design, and a few handy icon techniques. Even if you never plan to design isometric icons this is still a great tutorial to follow. You’ll learn the Inkscape GUI along with the overall process of crafting an icon from scratch. Now for something a little more practical you might also try this iPhone Inkscape icon. It’s also created by Nick Saporito so if you like his teaching style from the other videos then you’ll definitely like this one. It’s a pretty simple guide so any beginner should be able to follow along. Plus device icons are very popular so this is something that can find its way into a real-world project. We’ve all seen line icons since they’re some of the most common icon styles for modern websites. And since they’re often simply designed these are perfect starter projects for designers new to icon work. If you have access to Illustrator then this brief tutorial is perfect. It’ll cover the entire process of designing line icons from a blank canvas to the finished piece. You’ll learn how to formulate the overall “shape” of the icon, then translate that into vector lines that all connect properly. An excellent resource for new designers looking for an easy start. I couldn’t write this post without some Sketch tutorials and this weather iconset is a fantastic learning resource for Sketch users. It assumes some prior experience but you certainly don’t need to be an expert in Sketch. The icons are flat and mostly made of combined shapes so even if you’ve never designed icons before you should be able to follow through. You may not have a practical use for weather icons but this is merely an exercise to get you started. From here you can branch out and try any other designs you like. On a related note here’s another tutorial guide to Sketch covering line icons. It’s a bit shorter than the previous guide with this one totaling about 14 minutes. But through this tutorial you’ll build quite a few line icons from scratch and learn the overall process in Sketch. Again you don’t need to have much prior experience but it really helps if you have used Sketch before. If you have questions along the way you can always dig through other Sketch tutorials or the free documentation. Moving back into Adobe Illustrator we have this todo list tutorial showcasing how to design a paper pad icon with the long shadow effect. This video is actually based on this written guide from TutsPlus. However it’s often easier to follow a video since it’s crystal clear and shows you exactly how to position, restyle, and alter the design at every stage. I had to include this tutorial because it’s one of the more detailed guides to Illustrator. However there is one problem: no audio. Most tutorials offer guidance from the designer as they tell you exactly what they’re doing, which tools to select, and basically how to actually follow the steps. This food icon video is still do-able and it’ll lead so a beautiful finished result. But you’ll need to have some resilience to push through without guiding audio. Here’s another tutorial without audio but this one is by far the most detailed work I’ve ever seen. To successfully design this iOS cake icon you’re gonna need some proficiency in Photoshop and patience to work through the fast-paced video. But if you watch until the end you’ll be amazed at the result. This is no question one of the most detailed icon designs you can build and what you can learn from this tut will help your icon skills improve tenfold. If you don’t understand some parts of the video you’ll probably need to watch them over again, maybe in slow-mo if needed. But if you can follow even half of this video you’ll be amazed at what you can learn. As a follow-up to the cake icon tutorial, we have this detailed camera tutorial totaling about half an hour long. This moves a lot slower and it’s another tut that goes into great detail showing how to create a very complex icon from scratch. Thankfully this one does have audio instruction so it’s a lot easier to follow. You should be able to create this with any version of Photoshop and through the process you’ll pick up a bunch of icon techniques that you can apply to other projects. Well worth bookmarking if you want to excel at PS icon design work.